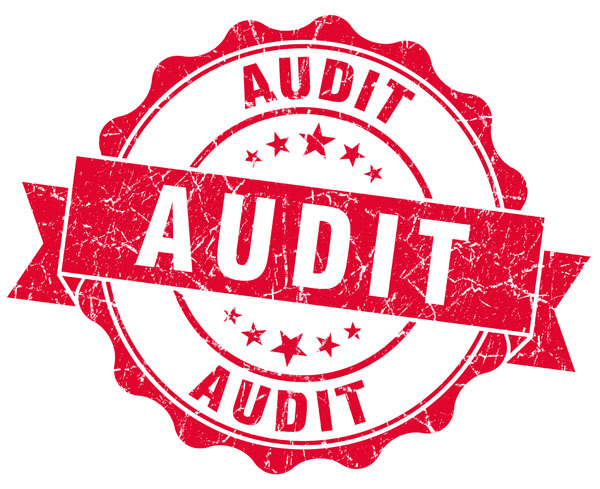 Independent auditors have given ARCHS an "unmodified" or "clean" audit for the 15th consecutive fiscal year. ARCHS' FY 2016 (July 1, 2015-June 30, 2016) financial audit was reviewed and approved by ARCHS' Board of Directors at the December 7, 2016 meeting. 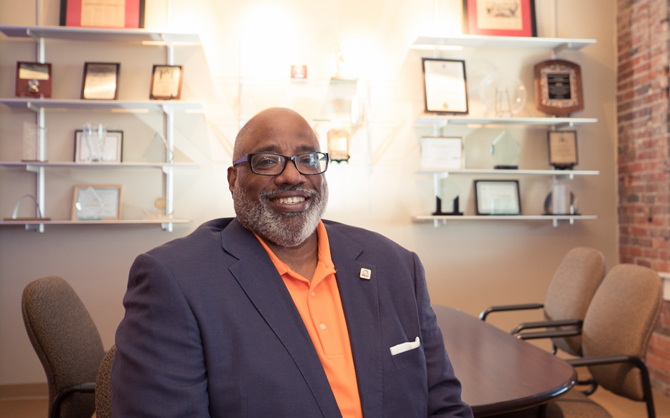 "Annual audits assure ARCHS' funders and program partners that our organization is responsibly and properly managing the resources entrusted to us," said ARCHS' Chief Executive Officer Wendell E. Kimbrough. "Our solid accounting controls ensure we are able to fund and enhance the delivery of more than 30 education and social service programs that annually improve the lives of more than 100,000 St. Louisans." For the seventh consecutive year, ARCHS has also successfully completed a federal 2 CFR 200 audit (formerly called an A-133 audit) for its work with federal funding. A 2 CFR 200 audit is required for any organization that expends more than $750,000 in a year in funding from the federal government. During FY 2016, ARCHS had a $19 million impact on the region. Within that number, $8 million were grants and other revenues, and $11 million were funds/resources secured by ARCHS' education and social service program partners. The FY 2016 audit also highlighted that ARCHS’ “administrative overhead” costs are 17 percent, substantially below the national average of 25 percent as calculated by the national United Way and other groups. This means that ARCHS is able to directly allocate at least 83 cents out of every dollar it manages to provide vital education and social service programs. The remaining 17 cents provide necessary program support services that help manage and evaluate the programs to assure their long-term success. During this season of Thanksgiving, I am deeply grateful for your shared interest in and support of our community. 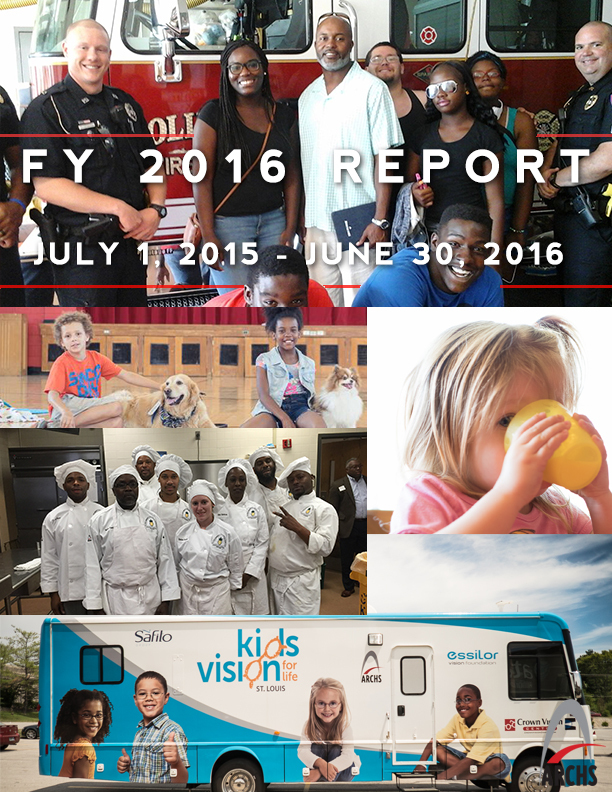 ARCHS’ growing network of strategic activities that invested $19 million in serving our most vulnerable residents is reflected in our FY 2016 Report (July 1, 2015 – June 30, 2016). As you read our report, I invite you to both celebrate ARCHS’ recent accomplishments and contemplate the ongoing challenges in our community. You may not be aware of all the many education and social services that ARCHS’ unique partnership model implemented this past year in order to impact a total of 119,600 adults, children, and their immediate family members. For example, we supported 47,000 children with these three services: 1) no-cost, school-based comprehensive vision care, 2) electronic benefits for summer meal purchases, and 3) free, high quality, five-days-per-week after school programming. In order to better serve our community, ARCHS’ staff members travelled more than 26,000 miles across metro St. Louis to provide 16,000 hours of strategic technical assistance and professional development training to 29 organizations and programs at 380 locations. I am humbled at the combined achievements – Board of Directors, staff, funders, and program partners – to impact our community’s needs. May you and yours have a blessed Thanksgiving. ARCHS was honored with a "legacy award" by the Helping Hands Food Pantry at their October 22, 2016 luncheon. 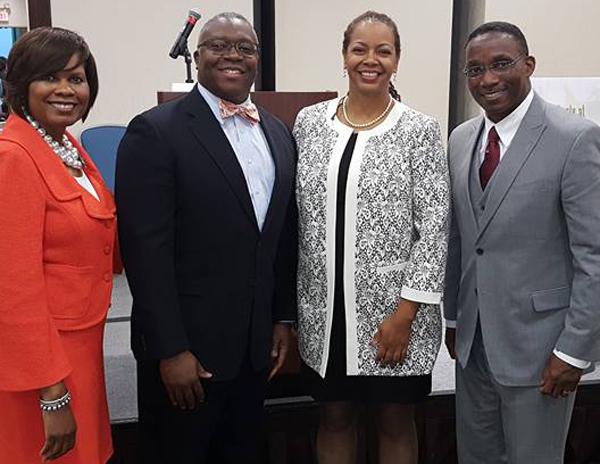 ARCHS' Les Johnson (pictured above second from left) accepted the award that recognized the leadership role ARCHS has played in supporting an innovative summer meals program. During the school year, many children receive meals through the School Breakfast Program (SBP) and National School Lunch Program (NSLP). When summer begins, these children lose access to healthy meals and their nutritional needs are not met when the schools close. Since 2012, ARCHS has participated in a national demonstration project to address this issue, providing more than 8,000 children with summer meals support. The households chosen received extra funding each month per child for the summer months and prorated amounts for the partial months when school ended in the spring and resumed at the end of summer. 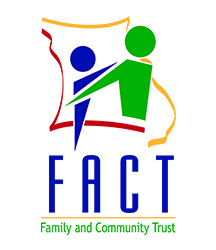 The St. Louis program is a partnership with ARCHS, U.S. Department of Agriculture, Missouri Department of Social Services, Family and Community Trust, St. Louis Public Schools, and Urban League of Metropolitan St. Louis. ARCHS is proud to celebrate the many achievements of Laura Haywood. Laura is a graduate of ARCHS' Culinary Institute for Ex-Offenders. She was recently recognized by her employer for her stellar work at Ballpark Village. In 2016, Laura was also honored by Employment Connection as their "Adult Client of the Year." In September 2016, ARCHS invited Laura to meet with officials from the Missouri Departments of Corrections and Social Services to tell her story and share her life experiences, struggles, and successes. 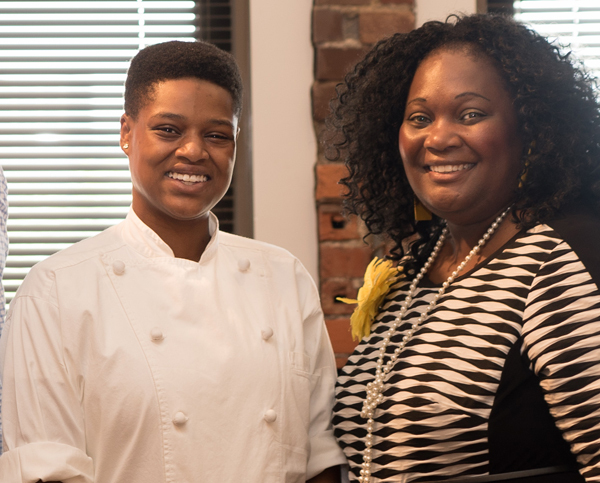 The Culinary Institute is a partnership of ARCHS, Employment Connection, and St. Louis Community College-Forest Park. Pictured: Laura Haywood (left) with ARCHS' Gail Dickson.